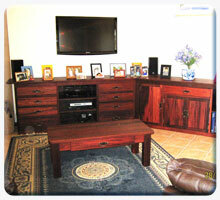 Lifestyle Jarrah's indoor furniture is made to order with solid timber so is unique to your design and requirements. From dining tables and buffets, kitchen accessories, bedroom furniture and things for kids from the best Australian hardwoods - Jarrah, Marri, Tassie Oak and Australian wormy chestnut. We can also imported timbers such as American white oak and cedar. Give us your ideas and measurements or a simple sketch and we would be happy to quote. 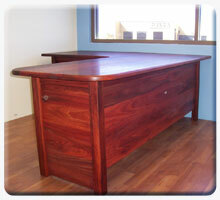 Do you only make custom furniture in Jarrah? Although we predominantly work in Jarrah we can hand make indoor furniture in most West Australian hardwood such as Marri and other Australian Hardwoods and we can get some imported hardwoods like American white Oak. How is your indoor furniture finished? Our Customers have the choice of our in-house Traditional old fashioned natural Tung oil and beeswax finish or we will send their project out to be professionally sprayed with polyurethane lacquer – either single pack or two pack – depending on the piece. 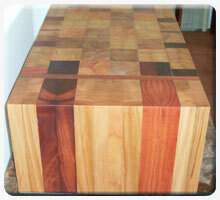 Jarrah and Marri Bar Tops and dining tables often are finished with a two pack. Our traditional oil finish is silky and easy to repair if scratched so ideal for furniture like bar stools which can be scratched by the stud on denims or keys in back pocket. 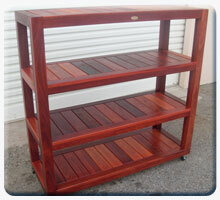 Do you stock Jarrah and Marri entertainment units, dining tables, bookcases? We don’t stock furniture ready for sale as each piece is made to measure. We do have examples of our work in a small display area/ showroom at the workshop and you are welcome to browse our website or visit us at the workshop to discuss your ideas and requirements. 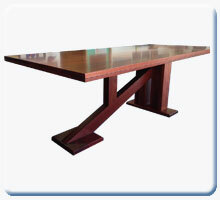 How long does it take to have a Solid timber table made? 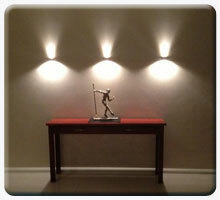 Lead times vary but we aim to have your custom indoor furniture order made in 6-8 weeks. If you have a special date or deadline we will do our best to accommodate you. If you have an urgent order please let us know and we will do our best to fit you in. Lead times do increase before Christmas so if you want something ready for Christmas please order early. Can you make me solid timber furniture with solid timber dovetailed drawers – I don’t want any veneers on MDF? We prefer to work in solid timber throughout, right through to drawer floors and cupboard backs but understand that each customer has their own preferences, so will work with you to achieve your aims. All our drawers are dovetailed. 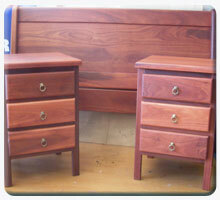 Can you hand make or custom make my furniture in Marri, Chestnut or Tassie Oak? Yes we can make furniture in most Australian hardwoods - in addition we can get some imported timbers such as American White Oak and Burmese Teak. Can you deliver our custom made furniture? If you live in the Perth Metro area we can deliver your furniture to your home – if you are “down south” in the Bunbury, Busselton, Margaret River area we have a transporter, Q2 Transport, who can deliver to you. 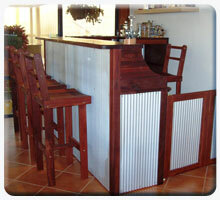 If you live in WA you may also have a local company who can collect from our workshop. 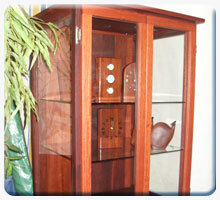 We have sent furniture with a furniture removals company to the Eastern States. I have English oak furniture. Can you make solid timber furniture to match my existing furniture? We can’t get English Oak, but have made furniture in American White Oak as the grain in the two timbers is very similar. 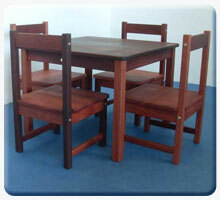 We have then sent the furniture out to a professional polisher to colour match it to your existing furniture. Our polisher will need a sample from your existing furniture, perhaps a drawer, to be able to match the colour. We have a small alcove in our living room; can you custom make some solid timber bookshelves to fit the alcove? Yes we can make bookshelves to your specifications and can provide the screws / supports needed but we don’t do installations like drilling into your walls – If you are not confident doing this your local handyman should be able to help. I can’t find a timber entertainment unit to fit my space. The ready-made hardwood entertainment units are all standard lengths – can you make an entertainment unit that is 1.96m long? Yes we would be happy to make you a unit to fit your space. If you can tell us what you would like it to look like and how many drawers, doors, shelves etc you need, we can work with you, sketch your ideas and quote for your unit.